When you are about to move, one of the first things you need to do is get boxes. LOTS of them. The cost of boxes can add up quickly if you don’t get them from an affordable source. Here are a few of the best places to get cheap and free moving boxes. Talk to family and friends to see if they have any spare boxes you can get off their hands. Also, neighbors that have recently moved to you neighborhood are a good bet to have some extra boxes lying around. By doing this, you’ll be doing a favor for them as well. The free section on Craigslist may not be your best bet for a good couch, but it is a goldmine for free boxes. Check this section regularly and if you see boxes listed be sure to call the owner beforehand so you won’t get there only for them to be already taken. Freecycle is another good “free” site that will often have boxes available. We don’t mean going into your neighbors backyard and digging through the trash. By dumpster diving we mean going to stores that have alot of unused boxes that would otherwise go to waste. Places like computer and furniture stores are good bets to have unused boxes that a manager would be glad to get rid off. If you try the other methods and come up empty handed, Wal-Mart is the reliable moving standby, selling reliably cheap moving boxes and supplies until the end of time (or until pigs fly). Remember, the earlier you start looking, the more likely you are to save money on getting your moving boxes. Good luck! 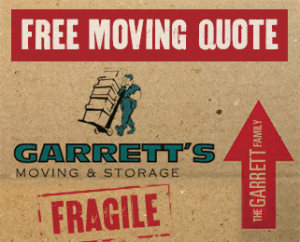 If you’re moving to Dallas, need moving services in Dallas or are looking for storage options, let Garrett’s Moving and Storage provide you a free moving quote.We’ve been in business for over 20 years and have a A+ BBB rating. We also have a best-in-the-industry extended coverage policy. Contact us today at 972-487-5843 for a free estimate or click here to request a quote online. Be sure to keep a look out for our next blog from Garrett’s Moving and Storage, one of the premier Dallas moving companies.